- [Narrator] Look at you. with nothing in life to make you happy. Even the bird thinks you're a loser. They're having the time of their lives riding their bikes. You'll never be as fun as those kids. 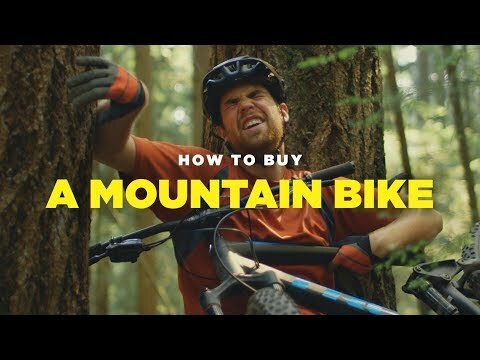 Unless you bought a mountain bike. try to sell you a bike. Pick a bike and buy it. Gear up and head out to your local trails. It's time to ride your brand new bike. Realize that not all bikes and bike stores are the same. Visit a bike shop and talk to the employees. Buy a second bike, go for another ride. This time, your bike doesn't fold in half. and confidence on the descents. Ride what you can and don't stress what you can't. You feel better already, don't you? that no one else rides in a t-shirt and khaki shorts. Start using sick words like shred and gnar. Keep riding, get passed on the climbs and the descents. The desire to be better grows inside of you. Become obsessed with your bike. and weird things like tire durometers. (clears throat) I mean, passion? Buy a bike for the third time. and the seat post goes up and down. - [Narrator] It's no longer just riding. It's more than just a hobby now. and how hard you're shredding. Her name is Jess and she rides too. She asks, "Want to go for a ride sometime?" It turns out Jess is good. She schools you on the climb up and the whole way down. You can't even walk down what she's riding. You make it to the bottom, but you're exhausted. but says that was a lot of fun. She says you guys should do it again sometime. You agree, even though she crushed you. But that doesn't bother you, until later that day. Start riding every day after work. that will help you step your game up. Become a better rider just by trying to keep up. and that cross country bike. Road biking could be fun. That looks a lot harder than you thought. He's really high up, that looks awfully dangerous. and go faster than you ever thought you could. Take care of and upgrade your bike. Buy tools, buy parts, buy more tools to install the parts. Spend hours deciding on your next bike. Discover your dream bike, and carbon. and more time looking at bikes. Ride more trails, mow more lawns. than you ever have before. most people don't even know exist. This time, you can actually keep up. This time, she only beats you by five minutes. she can't believe how much better you've gotten. One day, you see a press release for a brand new bike. 35% stiffer, and it's red. than the bike you just bought. Go out for a ride to get over it. and how much joy riding has brought to your life. it's about the rides your bike takes you on. Well, maybe not this ride.